Our ALS vehicles are operated by skilled medics and outfitted with advanced medical equipment and data devices required to stabilize and treat patients as well as transmit patient data to a hospital emergency department, catheterization lab, trauma center or during an interfacility transfer. EasCare’s ALS vehicles include Zoll X-Series ECG monitors capable of real-time transmission of 12 lead data to receiving hospitals and noninvasive hemodynamic monitoring via WiFi and Bluetooth connectivity. They also are equipped with Newport HT70 mechanical ventilators with multiple mode selections as well as noninvasive BiPAP/CPAP capabilities, ePCR charting and IVAC 3 channel medication infusion smart pumps. Enhanced trauma service capabilities also come with a versatile complement of advanced life support medical supplies and apparatus to manage and care for critically ill or injured patients. Our Advanced Life Support (ALS) ambulances are staffed with two (2) paramedics who meet or exceed the training and certification requirements set forth by the Commonwealth of Massachusetts. During critically ill or vent-dependent patients transports, EasCare staffs ALS vehicles with an EMT as well, so both paramedics are able to focus on the patient. EasCare Ambulance Service Chair Car vehicles safely transport patients confined to a wheelchair or requiring a wheelchair for transport. We can transport up to two (2) wheelchairs at any one time with seats for family members or staff to accompany the patient. Our wheelchair vehicles comply with ADA standards and are operated by CPR-trained professionals. Mobile Integrated Health (MIH) or Community Paramedicine are both terms used to describe the addition of non-traditional services that are provided by all levels of medical professionals. At EasCare, we have been a leader in collaborating with state and local health care systems to pilot projects to fulfill gaps in health care service delivery in our communities. 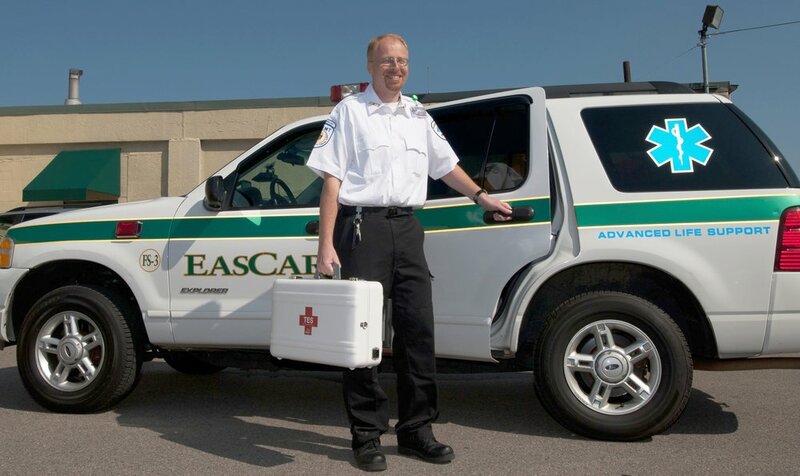 EasCare paramedics are the medical professionals deployed within an existing health care delivery model. EasCare partnered with Commonwealth Care Alliance, an ACO in 2013 to provide care to their patients. In 2012, EasCare partnered with Boston Medical Center to design a program that would enable EMT-Bs to work with discharge patients in their home. In that program, EasCare successfully prevented a significant number of readmissions, a key goal for any MIH program. In 2013 EasCare completed a Special Project Waiver with the Department of Public Health and Commonwealth Care Alliance, an accountable care organization, which provides insurance and primary care to over 20,000 members in Massachusetts. Their patient population is traditionally the sickest and most expensive demographic to manage, with significant health and socioeconomic challenges. EasCare is the only operating MIH program in the state. Our program has been recognized regionally, presented internationally and is being studied by The Patient-Centered Outcomes Research Institute with a federal grant over a three-year period. Want to Know More About Our MIH Program? If you'd like more information about our Mobile Integrated Health program or would like to learn how you can become an MIH medic, contact Chris DiBona, Director of Clinical Quality at Brewster Ambulance Service. The following articles pertain to the development and growth of MIH. As in all EMS capacities, providing in-the-field medical care requires ongoing skills assessment and training. Fortunately, EasCare has access to the brand new Mobile Medical Simulation Unit through Brewster Ambulance Service and Comprehensive Medical Teaching Institute, Inc. (CMTI), a Commission of Accreditation of Allied Health Education Programs (CAAHP) accredited training school for EMS professionals. From 1894 when the first Floating Hospital was established, Tufts Medical Center has been improving health care for neonatal and pediatric patients. As part of the contract with Tufts Medical Center, EasCare dedicated a specially-equipped ALS ambulance to provide transport care to Tufts Medical Center's most critically ill pediatric patients, branded for the Floating Hospital for Children at Tufts Medical Center. Since 2010, EasCare has served as the transport arm of the neonatal ICU (NICU) and the pediatric ICU (PICU). EasCare has been providing transport from area hospitals for at-risk deliveries, critically ill or injured babies and children who need to receive a higher level of care to Tufts Medical Center. The NICU is staffed by two BLS EMTs who travel to outside hospitals and pick up infants who either have not been born yet or are newly born and need the facilities of a neonatal ICU not available at the sending hospital. The sending hospital contacts Tufts Medical Center and arranges for the transfer, sets aside a bed, and the team travels with an isolette (an advanced self-contained environment to monitor the child's vitals, provide warmth, EKG, oxygen, etc.) to pick up the patient. The team also comprises a Tufts pediatric physician, nurse and respiratory therapist, who accompany the EMTs to the hospital where the patient is treated and transported inside the isolette in the ambulance to return to Tufts. When not on transports, the EasCare BLS EMTs have been trained to act as "Certified Cuddlers" for neonatal and pediatric patients to support NICU staff members in providing compassionate care to neonatal ICU patients. For PICU transports, the team is comprised by a Tufts transport pediatric nurse and an EasCare paramedic, and depending on the care required, a respiratory therapist. The EasCare paramedic is part of the team actively delivering care to the patient in the critical care ambulance. 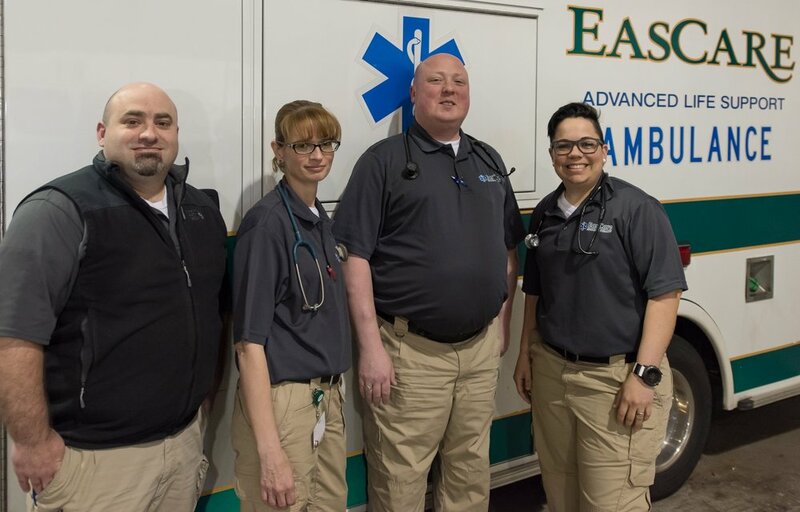 EasCare paramedics chosen for the PICU work have additional requirements on top of other staff members including Pediatric Advanced Life Support (PALS), and a monthly training session held at Tufts with other members of the transport team. The PICU truck also travels to outside hospitals and picks up ill or injured toddlers and children who need care not available at their hospital and brings them to Tufts Medical Center. The EasCare paramedic is generally there for their skill and airway maintenance. The EasCare team works very closely with the transport nurse. The EasCare team has great relationships with the Tufts staff and often accompany the nurses and physicians on rounds and practice their clinical skills.